If you have ever taken a quick look at your bill and decided it was too complicated, many customers have had that same thought. In this guide, you’ll find out how to read your OVO bill, what the jargon means and how you can use it to compare. The first page of your OVO bill should tell you most of the essential information you might need to know about your bill and account. First, let’s start off with your account information. Not only can you find out who your supplier is if you’ve forgotten, but you can also find their contact information should you have an issue. So, in the circumstance that you need to get in touch with your supplier, it can be convenient to have your account information to hand. Your account number and OVO ID means that OVO can find your account information easier, to fix any problems or answer any queries. The ID is used to manage your online account, so if you forget it, you can always find it on your bill. Then, you’ll see your statement information right below your ID. This has the date of your statement for your records, and your statement number which is unique for the OVO system. 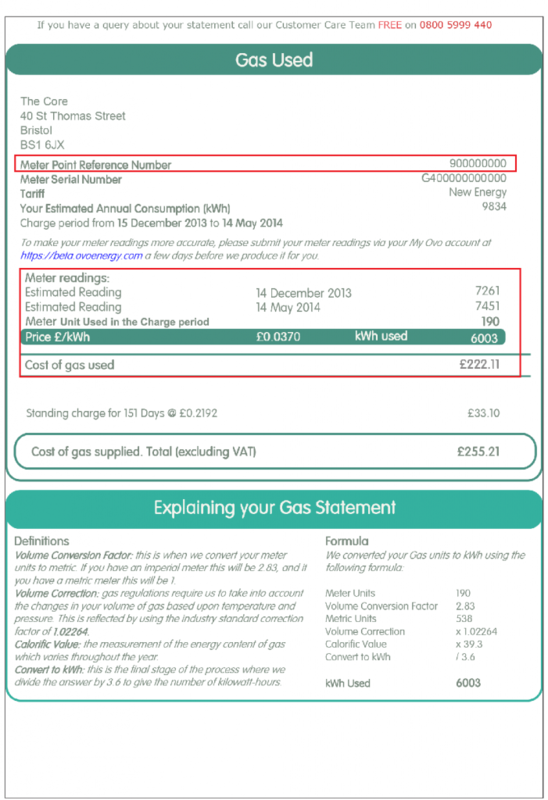 Secondly, take a look at the actual information about your bill. This will include things such as your charges for that particular period; your costs split per your fuel type and things such as your total charges. Your bill will reflect how much you were charged on your electricity and gas, as well as a total so you can see how much your statement will be. 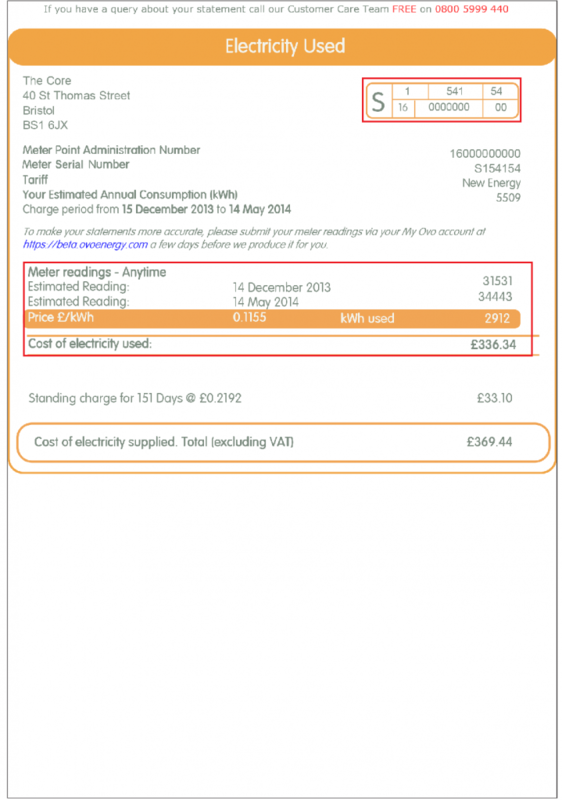 The second page of your OVO bill has information regarding a breakdown of your electricity and gas tariff. Variable means that your energy prices are going to increase or decrease with the open market, which can give you significant savings or cost you dearly depending on the market. Fixed rate tariffs mean that your prices are set, usually for a certain period such as a year or two. During this time, your energy supplier can’t increase the unit costs of your energy. However, this doesn’t mean your monthly bill will be set entirely as some months you use more energy than others. Your payment method refers to the way that you pay for your energy. For instance, paying by direct debit means that a payment is taken out of your chosen account automatically, usually on the same date each month. The next part tells you more about the costs associated with your tariff, like your unit rate and any exit fees. A unit rate refers to the cost of your energy per kWh. In other words, for every unit of energy you use, you have to pay a certain amount. When you have a standing charge, it means how much you will be charged for your energy every day that you don’t use a single kWh. If you decide to switch before the end of your contract, you will have to pay a certain exit fee. 49 days before your contract ends, your supplier should contact you and notify you of this. If you switch during that time, you won’t have to pay an exit fee. So let’s say you go away for the weekend. According to this bill, OVO will still charge you 21.92p a day, meaning that your weekend away will cost you around 44p. 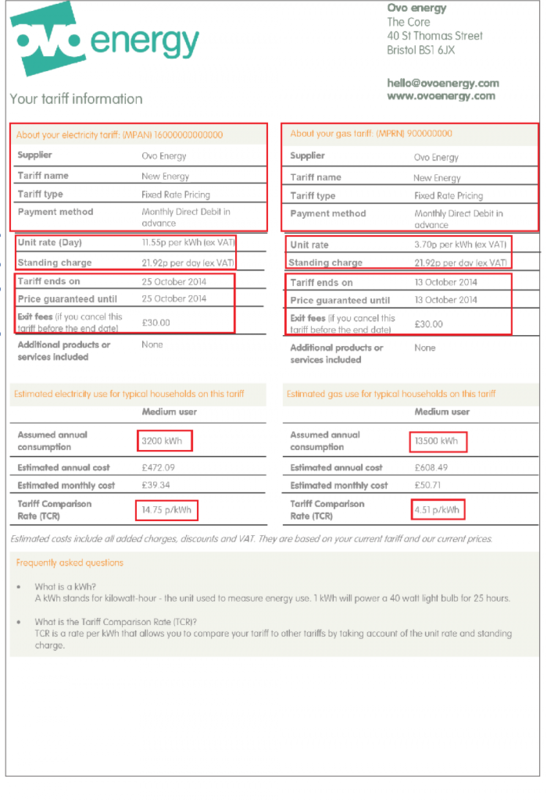 The last section concerning your tariff has when your tariff ends and how long you have set prices. This will let you know when your contract ends, which is usually when your energy supplier switches you onto their expensive variable rate tariff. That’s why it’s important to try and switch before that time, even if it’s onto a fixed rate tariff from the same company. Your price fixed prices are often guaranteed up to a specific date, which the bill will show you. At the bottom of the second page, you’ll find the estimated usages for typical households on the same tariff. For instance, a medium user uses approximately 3,200 kWh of electricity and 12,000 kWh of gas. A medium user is often a three bedroom household, so if you think this applies to you then you likely fit within this usage which can help with comparing suppliers. This is because comparison tools can help estimate your costs based on the amount of energy you use. The third page of your OVO bill contains information regarding your account summary. Luckily, OVO has made this page very self-explanatory now that you know what specific terms mean. On the left, you will see ‘your energy contract’. This tells you about which tariff you are on, information about the standing rates and when your contracts will end. It will tell you about your payment plan which reminds you how you pay for your energy; for instance, by direct debit. You can find out about any exit fees you may have to pay if you decide to switch supplier early, and any additional charges. This is a sort of yearly projection, and it will tell you how much your annual energy costs will be assuming that nothing changes during that time. The most important part of your fourth page is your MPRN and meter readings. MPRN = This is the unique number of your gas supply at your property. This is usually helpful when comparing or switching energy suppliers. Meter readings are an essential part of your billing, as the more meter readings you submit, the more accurate your invoice will be. This is because your meter tracks your actual energy usage, so if your supplier doesn’t have these numbers, they can’t bill you as they don’t know exactly how much energy you have used. It is advisable to try and submit as many meter readings as possible, so you don’t get overcharged for your energy. Your last and final page of the OVO bill contains some other information that might not be immediately useful, but you may need it in the future. Underneath your MPAN number, you’ll find the electricity version of your meter readings. Take a look at page four to see why meter readings are so critical to get an accurate bill. So why compare suppliers or tariffs? There are hundreds of deals out there from many different suppliers, each with their pros and cons and it can be challenging to decide which one is better for you. That’s where EnergySeek comes in. Not only can you use the handy, simple comparison tool at the top of the page, but you can also make use of the extensive guides on offer. The guides will tell you about different suppliers. Including their tariffs, prices, extra services or even their customer satisfaction. Have you decided that comparing might be a good idea? You need to take into consideration what it is that you want the most in your supplier. This could be value for money, customer satisfaction or even based on the extra services that they offer, such as the British Gas boiler care. 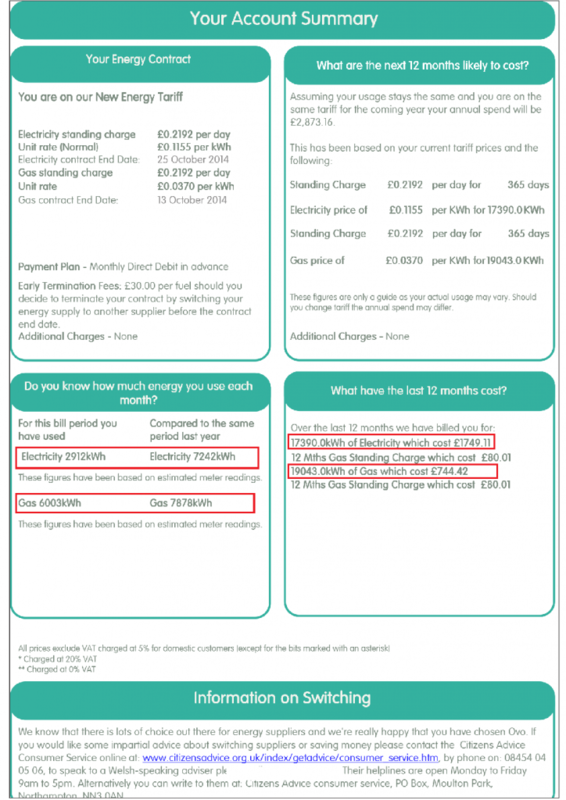 Finally, you can then use a comparison tool to compare tariffs and energy suppliers to see which would be best for you. 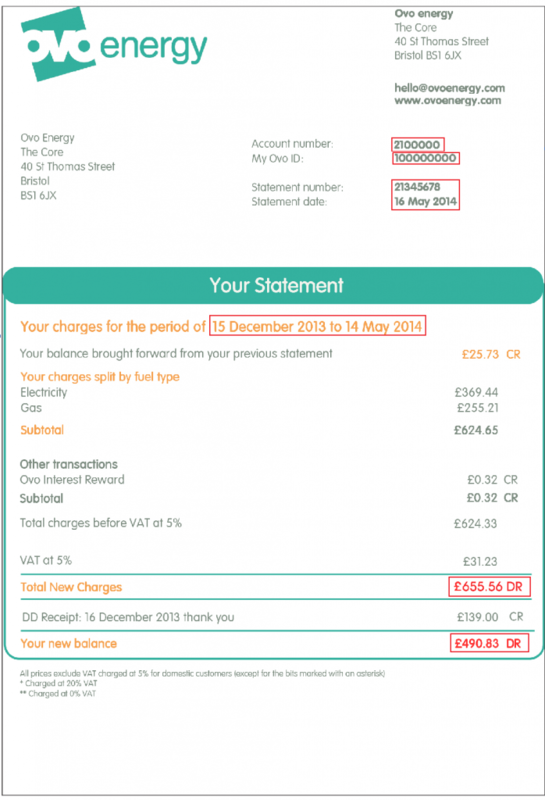 Are you interested in switching your energy supplier? Which Energy Companies are British Owned?